Mining is a very important industry in Mexico. Silver, gold, lead, copper and zinc, among other minerals, are abundant in the country. That is the main reason why Mexico has become the leading exploration investment destination in Latin America. Geometrica recently completed a pair of circular domes for Penoles in the state of Sonora, located in the north of the country. This area and this state in particular is the most important one in terms of mining. The Herradura mine is located in the municipality of Caborca, near the coastal city of Puerto Penasco, and close to the border with the United States. This mine started operating in 1997 and is one of the largest open-pit gold mines in Mexico, with an annual material movement of approximately 120 million tons. The land is part of the Sonora desert, with extreme and dry weather conditions. Aerial view of the site where the domes will be located. 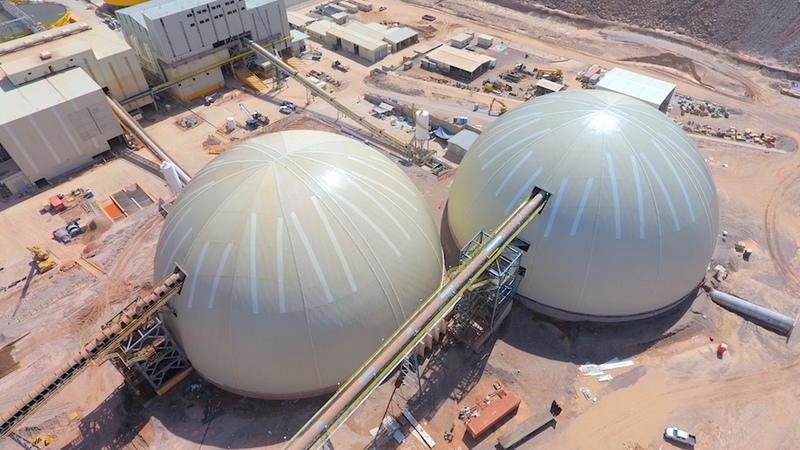 Geometrica supplied two 70m diameter and 35m high domes for storage piles in this plant, while keeping one of them always operating. To achieve this, the assembly was planned using the lift and place method. This procedure consists of dividing the geometry into modules or sections that are assembled individually, to later be placed and form the dome. The Geometrica system allows the structure to be assembled manually in a safe, quick and simple way with local labor. Most of the work was carried out at the ground level. This section was assembled completely on the ground. Once each section is completed, it is lifted using standard construction cranes and placed in its position, allowing a smooth planned, ordered and efficient construction. All operations were performed without stopping the material storage operation. Each section forms the dome toward the pile in operation. Geometrica domes help control dust in mines and industrial plants. This has multiple benefits: it boosts productivity by preventing material loss, and it protects workers and the environment from noise and airborne particles. The dome is ready to be clad. Geometrica structures are designed according to the specific needs of each project. In this case the domes have openings for the conveyor belt, its supports, and the entry of trucks. Also, by incorporating lines of translucent materials natural lighting is added to the interior. Geometrica has already built other domes for Peñoles, and the good relationship continues in this, the Herradura mine and in other projects under construction. The new twin domes in Herradura.